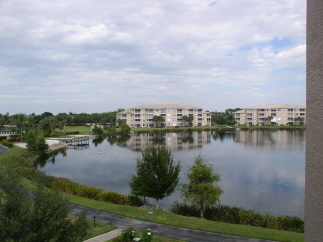 Premier top floor, end unit with sweeping lake view is in PERFECT condition. Heritage Cove is a very active 55+ age community with lots of activities and is close to beaches and boating access. This is an ideal winter (or year-around) residence for those who want an active lifestyle with congenial neighbors. Interior Features Very open, top floor END unit is very light and bright (extra windows) and livable. Kitchen is well-equipped and has a nice breakfast room; acrylic windows on the lakefront lanai to open or close on cooler, breezier days; a den for office or overflow guest sleeping; crown & chair molding, custom mirrors, etc. all add to the attractiveness of this very special residence. Exterior Features Heritage Cove is a perfectly manicured and maintained GATED community with low fees, LOTS of activities, and this condo's location is a very short walk to the pool, clubhouse, fitness center and more. Additional Features and Amenities Shows like a model and everything is included--tasteful furnishings, accessories, TV's, computer, stereo--move in NOW and start enjoying the Florida lifestyle immediately!